GX Trader clears with COR Clearing. Clients download trade history from their COR Clearing online account. Choose Account Activity as the splash page for best results. 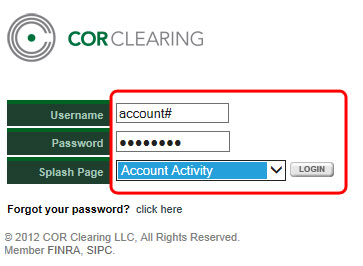 Or, after logging in, navigate to Account Information then choose Acct Activity. Enter a Start Date and End Date for the desired date range, make sure that Trade History is selected for Filters; then click SEARCH/REFRESH. After your Account Activity report displays, click on Download to Spreadsheet to download the data. Depending on your browser, you may be prompted to save the file or open - click Save. Make sure you use the Save In drop down dialog box to save your file to your "c:\my documents\TradeLog\import" directory. Click on the Gxtrader Imp button. The COR Clearing Import dialog appears. Select your trade activity csv file which you downloaded, and click on the Open button.